Indian schools have seen expansion of infrastructure, learning resources and enrolment at the school level in the past one and a half decade. 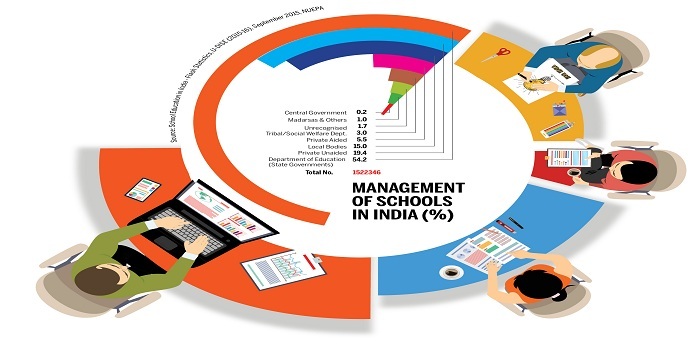 India is recognising education as an integral factor for nation’s development, and thus the country has seen rapid engagement and involvement of both private and public schools Careers360 showcases the macro picture of Indian schools below. India is witnessing an unprecedented expansion of infrastructure, learning resources and enrolment at the school level. With the recognition of education as an integral factor for nation’s development, the country has seen rapid engagement and involvement of both private and public schools, particularly in the last one-and-a-half decades. What initially began as a move towards universalising elementary education through Sarva Shiksha Abhiyan has got a new perspective with the Right to Education Act. There is a clear realization that with the emergence of a knowledge-based society, secondary education has a fresh focus where students become good citizens and contribute to India’s development goals. Listed below are some of the figures that give a macro picture of Indian schools.